The Prince Estate has joined forces with the famous colour company to create a shade they've dubbed Love Symbol #2. Prince is set to get his own shade of purple. The late musical icon - who passed away in April last year at the age of 57, has become synonymous with the colour since the release of his hit Purple Rain musical, single, and accompanying album. Now, it has been revealed that The Pantone Colour Institute have teamed up with the late star's estate to develop a new shade in his honour. The shade, entitled Love Symbol #2 after the star's famous name change to an unpronounceable symbol in the late 1990s, was "inspired by his custom-made Yamaha purple piano." 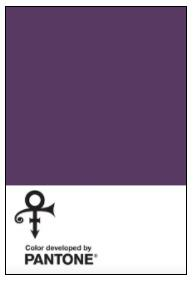 In a press release, The Pantone Colour Institute said: "We are honoured to have worked on the development of Love Symbol #2, a distinctive new purple shade created in memory of Prince. A musical icon known for his artistic brilliance, Love Symbol #2 is emblematic of Prince's distinctive style. Meanwhile, it was previously revealed that a musical based on the works of the When Doves Cry singer is on it's way in 2018. Director Gary Lloyd said in a statement: "Prince's music and constant reinvention is legendary, so to get the opportunity to bring that and all his colourful characters to the theatrical stage is a dream. "There is also a real appetite for live music shows that showcase the musicians as part of the performance. Prince was all about this. Prince was a consummate, theatrical artist, but in our show his music is the star. "There will be so much for audiences to enjoy whether they're fans of musical theatre, Prince, or both. 'Purple Rain' is a fast-paced, music lover's night out that will tease, surprise and excite audiences in the same way he did."